Overlooking Black Point’s Port Alfred Bay, Albarino is a 2-bedroom beachfront holiday house with fantastic views. With 2 trio bunks, Albarino sleeps a maximum of 4 guests, with quilts & pillows provided. Guests will need to bring any other linen with them, including sheets, pillowcases, towels & tea-towels. The bathroom has a shower only (no bath) and a toilet. The centrally located open plan lounge, kitchen, dining room has split system air-conditioning, and pedestal fans are kept in both bedrooms. In the lounge is plenty of seating to choose from including corner lounge suite and bean bags, plus a large television with USB port. The kitchen is fully equipped for any length of stay with a fridge/freezer, microwave and electric stove. For coffee lovers, there is a coffee plunger and percolator (guests will need to bring their own ground coffee). There are great views to be had from the front deck, with seating & an outdoor dining setting so some of the best Yorke Peninsula sunrises can be enjoyed. A flat plate gas barbecue is also located on the deck. Guests have direct beach access from Albarino’s deck via the stairs, and like most properties in Black Point there are no fences. There is plenty of off-street parking, with room for up to 2 cars and a boat, and the Black Point boat ramp is just nearby. 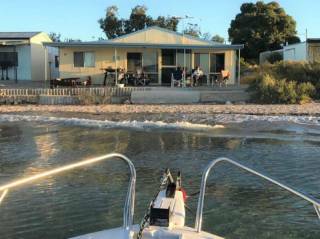 Albarino is a great compact holiday accommodation, suitable for a couple or a few friends wanting a relaxing Yorke Peninsula holiday. With a double bed and a trio bunk, Albarino sleeps a maximum of 5 guests, with quilts & pillows provided. Guests will need to bring any other linen with them, including sheets, pillowcases, towels & tea-towels. The bathroom has a shower only (no bath) and a toilet. The centrally located open plan lounge, kitchen, dining room has split system air-conditioning, and pedestal fans are kept in both bedrooms. In the lounge is plenty of seating to choose from including corner lounge suite and bean bags, plus a large television with USB port. The kitchen is fully equipped for any length of stay with a fridge/freezer, microwave and electric stove. For coffee lovers, there is a coffee plunger and percolator (guests will need to bring their own ground coffee). 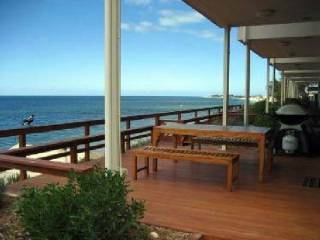 There are great views to be had from the front deck, with seating & an outdoor dining setting so some of the best Yorke Peninsula sunrises can be enjoyed. A flat plate gas barbecue is also located on the deck. Guests have direct beach access from Albarino’s deck via the stairs, and like most properties in Black Point there are no fences. There is plenty of off-street parking, with room for up to 2 cars and a boat, and the Black Point boat ramp is just nearby. Guests also have access to the mooring at the front of the property. 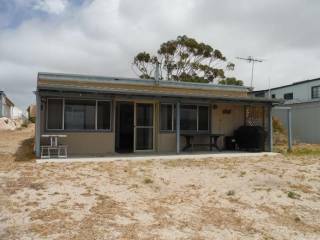 Albarino is a great compact holiday accommodation, suitable for a couple or a few friends wanting a relaxing Yorke Peninsula holiday.